What does operating a supply chain entail in 2019 and beyond? The question might seem like an odd one to ask, yet it’s worth thinking about as many new technologies reshape long-held conventions about everything from basic demand planning to ERP system setup and integration. The Internet of Things (IoT), blockchain, robotic process automation: These are just a few of the technical breakthroughs that have emerged over the last decade and enabled the rise of the digital supply chain. To see the rapid pace of the change, consider that LTE cellular networking launched commercially only a decade ago, in 2009. By 2018, the use of LTE networks for IoT connectivity alone was an $800 million market and by 2023 it could total $2.3 billion, according to Reportlinker. While its 28.4 percent compound annual growth rate over that period is impressive, it will actually be outpaced by the expansion in managed services that support activities such as cloud computing and machine-to-machine communications. Given the rapidity and scope of the ongoing transformation in supply chain management (SCM), it was always inevitable that challenges would arise. In this post, we will look at a few things that we wished we had known at the dawn of the digital era in supply chains, before they caused some trouble. Looking back at these challenges will be useful in preparing for the ones to come. At its core, digital transformation in SCM is about updating the supply chain to harness the power of technologies for improved communications, more streamlined operations and fewer delays and inefficiencies. The tech in question could be an Oracle Cloud ERP for better financial management, a blockchain for greater trustworthiness when dealing with partners, a unified communications suite for keeping everyone in sync or one of many other possibilities. But in reality, the old standbys of email, fax and phone still play an outsized role in managing the supply chain, as indicated by the 48 percent of executives who cited these channels as their main ways of communicating with supply chain partners in a 2016 survey. Any digital push will have to provide compelling alternatives to these familiar modes. Such alternatives should be selected and implemented to meet the specific needs of end users and project stakeholders throughout the supply chain. Modern ERPs are integral to digital supply chains, with their cloud-based infrastructure offering the best solution for scaling and supporting a full range of operations. However, they can still fall victim to the same issues that have plagued ERP implementations for decades, namely inevitable delays and cost overruns. A 2019 Cloud Security Alliance (CSA) survey captured the divide between the appeal and reality of cloud ERP. While two-thirds of respondents reported having moved to cloud ERP or being in the process of doing so, many were concerned about security risks and the complex workflows required for safely moving their data to a new system. Cloud undoubtedly offers major benefits, including high availability, tight security (despite the widespread concerns, it is often technically safer than an on-prem equivalent) and pre-built integrations. At the same time, the devil can be in the details, at least when it comes to implementation. Accordingly, it’s important to select the right partners to manage the project from start to finish. Related to the item above, it’s usually a good idea to overestimate how long an ERP migration, or any other switchover during digital transformation, will take, instead of setting an overly aggressive timeline that won’t be met. Transitioning from an on-prem system to a hybrid or hosted alternative is a complex process, with many possible pitfalls along the way. Ninety percent of CSA survey respondents reported encountering unexpected problems during their data migration processes. That’s not surprising, considering the stark differences between traditional and cloud ERP systems. Siloed systems need to be connected, processes updated and critical information moved to the right places – all of which takes time. In addition, most on-prem systems were designed at least 1-2 decades ago. Business processes have significantly changed with the introduction, or much wider adoption, of outsourced partners and with supply chains becoming increasingly global, requiring re-designing of several business processes. A 2017 Panorama ERP report revealed that only 41 percent of ERP implementations were on or under schedule, while 26 percent were over schedule by at least 25 percent (the other 33 percent were over by less than 25 percent). Consult with your partners to ensure you have a timeline that is realistic. To avoid the natural risk of pursuing digital capabilities because they appear relevant to the needs of the business, develop a set of success criteria for each new capability. Update them as necessary through the life of the project as you learn more, but don’t forego them. These success criteria may be operational or directly financial in their structures. One of the most frequently seen ‘lessons-learned’ in digital transformation post-programs reviews is to make sure the digital capabilities implemented solve business issues that are important to the success of the business. Often, companies realize the best way to assure this is to establish success criteria that connect directly to the business’ financial and growth plan. 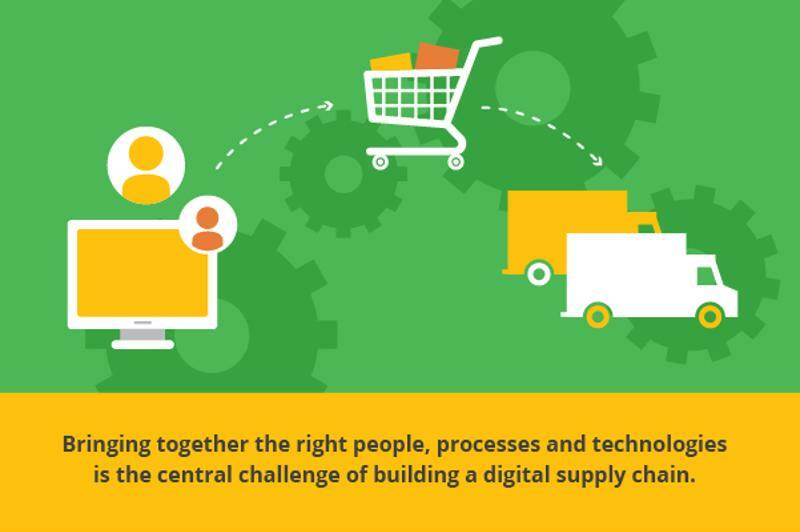 Bringing together the right people, processes and technologies is the central challenge of building a digital supply chain. An experienced partner can make the difference between a digital transformation that eventually pays dividends and one that saps too many resources over the course of many years. The Inspirage team is a group of experts in integrated digital supply chains, with particular expertise in Oracle solutions. To learn more, visit our Resource Center or contact our team directly. This entry was posted in Digital and tagged Digital Transformation. Bookmark the permalink.